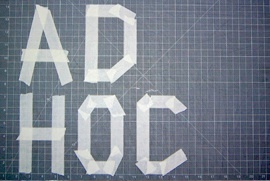 I wanted to tell you about AdHoc: a 6 hour fast-and-dirty charrette competition for students resulting in the actual construction of a small-scale element for the school. We're doing this to promote actualized design in an otherwise hyper-theoretical environment. We want to encourage students to think towards building instead of presentation boards. Vito Acconci is going to act as head juror in conjunction with a jury of faculty. Next year we're going to expand the competition to include other schools in the hopes of spurring interactions among otherwise isolated institutions. The charette is Saturday, March 31st, starting at noon, Princeton, New Jersey.